Columbia, TN July 22, 2017 – Overton County young farmers Joseph and Rebecca Smith were named Tennessee Farm Bureau’s Outstanding Young Farmer and Achievement Award winners. The results were announced during the Tennessee Young Farmer Summer Conference held at the headquarter offices of the Tennessee Farm Bureau in Columbia, Tenn. The young dairy farmers from the Monroe community competed against 12 other county contestants across the state to be named the state winner and have the opportunity to compete for national honors in January. Joseph and Rebecca were named this year’s winners based upon farm and financial records from the farm year 2016. They farm in the Monroe community and their herd has more than 200 Holstein cows they milk twice a day. They raise corn, wheat and hay to feed their cows. They have a custom spreading and hauling business for local farmers and recently added laying hens to their operation to sell eggs locally as well. Both Joseph and Rebecca have been very active in the Young Farmer and Rancher program, as well as the Overton County Farm Bureau and their local community. Both have served on the Tennessee YF&R State Committee, with Joseph even serving as state chair in 2014. 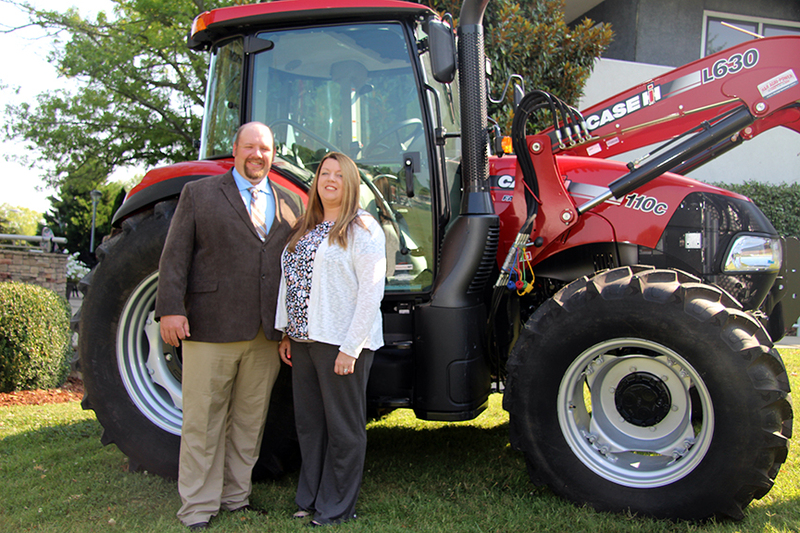 As state winners, the Smiths receive a year’s free use of a brand new Case IH tractor up to 150 hours. They also receive $1000 and a fully-loaded Kubota RTV from Tennessee Farm Bureau, an insurance policy to cover the tractor for one year from Farm Bureau Insurance of Tennessee, $500 in qualified Farm Bureau Services, $500 in services from Farmers Services and a trip to the American Farm Bureau Convention in Nashville, Tennessee in January 2018, where they will compete for national honors with other state winners. The national winner will get a 2018 truck, provided courtesy of Southern Farm Bureau Life Insurance and paid registration to the 2018 YF&R Leadership Conference in Reno, Nevada. The runners-up will receive a Case IH Farmall 50A tractor, courtesy of Case IH. Third place finalists of will receive a Case IH 40” Combination Roll Cabinet & Top Chest and $500 Case IH parts card, courtesy of Case IH and $2,000 of Stanley Black & Decker merchandise (PROTO, Dewalt, Stanley, Lenox & Irwin) courtesy of Stanley Black & Decker. Fourth place finalists will receive a Case IH 40” Combination Roll Cabinet & Top Chest and $500 Case IH parts card, courtesy of Case IH. AJ and Valerie Teal of Coffee County were named runners-up in this year’s competition. District winners were: District One – Todd Littleton of Gibson County; District Two – Tom and Stephanie Barnett of Montgomery County; District Three – Kary Robinson of Franklin County; District Four – Nicholas and April Patterson of Clay County and District Five – Lorie and Ben Fleenor of Sullivan County.